Responsibilities: In my role as the press intern, I took photos, made social media graphics and assisted the press team with interviews. I also interacted with constituents and gave capitol tours. What was the best part about your summer internship? The best part about interning on the hill was that there was always something exciting happening. My tour groups would always say, “I can’t believe that we’re here when this is going on!” I was thankful to experience twelve weeks of that excitement while living in Delta Hall as part of the Grady DC program. Madison’s official picture with Congresswoman Karen Handel. Madison was a member of the congresswoman’s first class of interns. The best part about my summer internship was getting to work for Congresswoman Handel. I have looked up to her for a while now and I really enjoyed working with her and her team this summer to represent my home district. On my last day she thanked for all my hard work. It was a surreal moment to have my role model tell me that she was proud of me. What is the most memorable experience you had during your internship? My most memorable experience was getting to be a part of Senator Perdue’s press team. They were so welcoming and they really went out of their way to create opportunities for me. One of my favorite memories was getting to update the senator’s Snapchat account at the United States Marine Corps at a special Sunset Parade where he was being honored. What was the biggest surprise in your internship? 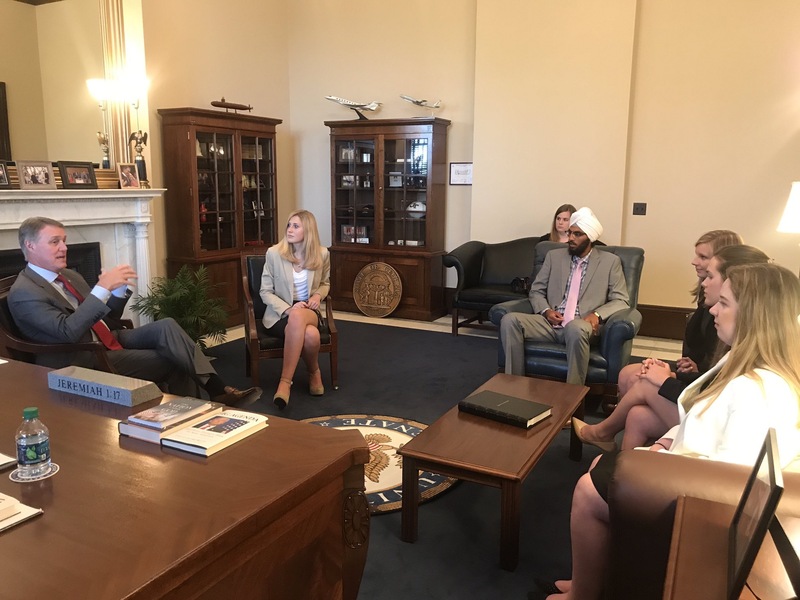 Madison and her fellow interns meeting with Senator Perdue on their first day in his D.C. office. I was surprised that there were so many UGA alumni in D.C. I met and worked with so many great alumni who were all excited to mentor me. I would definitely recommend for anyone going up to the hill to reach out to the alumni association because they were such a great resource for me and the other students living in Delta Hall. What advice would you give to a student looking for an internship? I would tell students to ask for help when applying to internships. Grady has great connections all over the country and my professors were a great resource for me and the other students in the Grady DC program. What part of your Grady education did you find most valuable during your internship? While I was on the hill, I was thankful for everything I had learned in the Public Affairs Professionals classes. Our professors, Brian Robinson and Joseph Watson, really prepared me for my internships and I was glad to know I could always email them when I had questions or needed advice. Eleanor Traynham, a double major in political science and public relations, is one of three University of Georgia students selected as the first Chambliss Fellows. The fellowship program is part of the Chambliss Leadership Forum, which honors the commitment of public service that has defined the lives of former Sen. Saxby Chambliss and his wife, Julianne, and provides a platform to share his insights and expertise with the next generation of leaders. 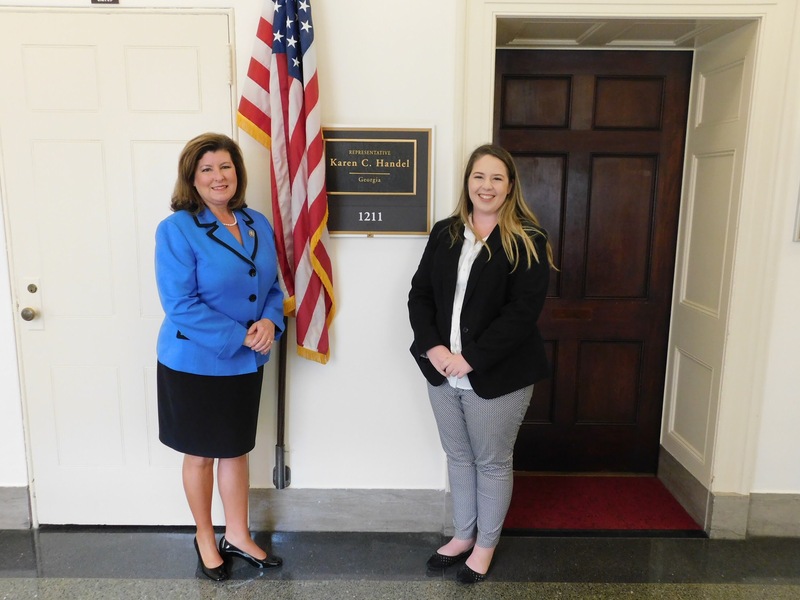 Traynham is spending the Spring semester at UGA’s Delta Hall Washington, D.C. working in Sen. Johnny Isakson’s office. She hopes the internship is the start of a career in Washington, D.C.
Traynham knows she wants to work in politics and plans to take this opportunity to decide on the exact role she’d like to play and where she sees herself in the future. Read the full story in UGA Columns.